Junk Cars Wanted! Is your old car broken down at work? Maybe was it parked in the backyard years ago because of the repair bill at the shop too high? Even if you just got in a crash we want to buy your junk car. Roscoe's junk car removal operators come to you. They will pay you in cash on the spot for your car. We do the DMV paperwork with you. Our driver will quickly and safely remove your junk vehicle. 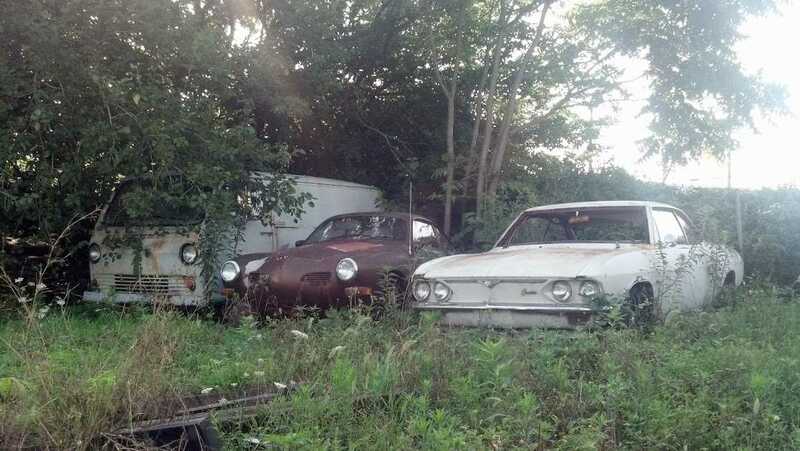 We Buy Junk Cars in Richmond as well as surrounding counties in Central VA such as Henrico, Chesterfield, Hanover, Goochland, Powhatan and parts of other nearby areas. "Who buys junk cars near me?" You found the right place! Roscoe's Pays Cash for Cars in Richmond, Henrico, Chesterfield & Surrounding Counties in Virginia. We have FUN buying salvage cars, get paid CASH for clunkers junkers and heaps! Rollback Service, the right equipment allows for quick and safe junk car towing. Richmond VA's Best known Junk Car Buyers. Do you have a Junk Car in your yard or driveway? Turn that eyesore into income. Get PAID to watch it leave on our truck! Roscoe's is a junk car buyer that pays cash for cars. We will come to you. We handle all the paperwork and perform the junk car removal immediately. We pay cash for junk cars! Roscoe’s is a licensed, insured, BBB accredited local family owned business that specializes in paying money for junk cars. You will not have the inconvenience of "junk man" pricing hassles. The price we offer you to sell your junk car on the phone is exactly what we will pay for your junk truck, scrap car or van when we arrive. Worried about "tow company" scheduling games? Don't be! We buy junk cars and it's all we do. Your appointment is our priority. Get more cash for junk cars Richmond Va! Are you looking for cash for junk cars in Richmond Va? Consider our junk car pick up company to alleviate your current frustration. Roscoe's Junk Cars. has been buying junk cars for money in Richmond Va the "right way" for years. Get your junk car picked up while junking your car for cash. 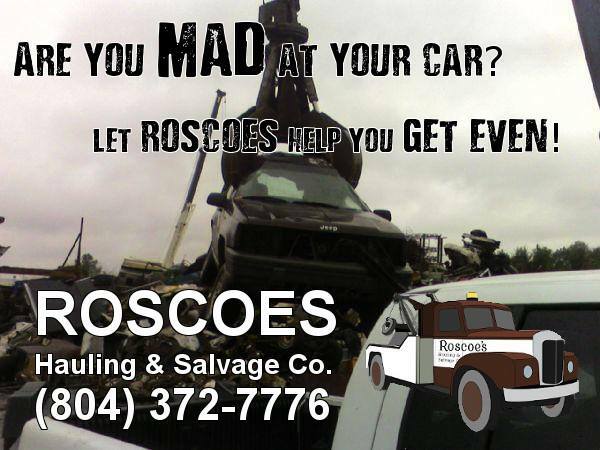 Roscoe’s is an environmentally friendly and local family owned junk vehicle removal business. Call Roscoe's now for junk car removal in Richmond, VA, and surrounding areas. We buy junk cars. We are a local junk car buyers based right here in Richmond VA. If you are searching for "cash for junk cars near me" or a place to "junk my car" you have found the right company. We pay cash for junk cars as well as junk trucks and vans. We don't just pay cash for cars; we offer Immediate junk car removal. Your call and your appointment is our priority. We buy junk cars in Richmond, VA and surrounding areas such as Chesterfield, Hanover, and Henrico County. Not trying to junk your car but simply needing a tow? Let one of our partners help you out. Please visit our Towing page. Can I still get Cash for Clunkers? Yes! the government cash for clunkers program is long gone but companies like Roscoe's still pays cash for clunkers junkers and heaps, we even come to you to do it. Where can I find places that junk cars near me? Roscoe's and companies like us are located right in town and are easy to find. Before you decide who to call be sure to check reviews and the BBB to make sure you are dealing with a licensed junk car removal company. Whereabouts do I junk my car? You don't have to go anywhere to junk your car, We come to you to buy junk cars. Junk vehicle removal is just that. Roscoe's to you and removes the junk vehicle, fast! Where can I sell my car for cash near me? Many local dealerships buy cars and sometimes even pay cash on the spot but only Roscoe's will pay cash for any car in any condition. Scrap your car for cash! Roscoe's is a junk car removal company that buys junk cars trucks and vans. Sell your junk vehicle to Roscoe's to get the most money for junk cars trucks and vans. We are located centrally in Richmond VA but also service all surrounding areas such as Hanover county north of us, Henrico County to the east and west, as well as Chesterfield county to our south. Now you know; I can junk my car at Roscoe's! While we are located centrally in South Richmond, our service comes to YOU! We do accept vehicles dropped off at our location without an appointment, nor do we sell parts to the public at this time. Roscoe's Junk Cars is growing! We expanded from our original location here in Richmond VA to buying across the State. Now we are buying junk cars from several states in our region. Feel free to visit our national site if you are curious about what we are up to or are interested in seeing if we offer our junk car removal service near you! Roscoe's Junk Cars - Junk Car Removal & Cash for Junk Cars.